January 27, 2010 – 2009 was a year of notable developments, marked by a new administration, corporate and financial scandal, and strong attempts to revive the economy. The latest quarterly findings from the Chicago Booth/Kellogg School Financial Trust Index, issued today, highlight how trust has evolved in the last 12 months. In the past year, trust in the financial system has risen since the height of the economic crisis, up to 23 percent in December 2009 from 20 percent in December 2008. In reviewing the various subsets that comprise the Index, a remarkable increase in trust toward “Main Street,” with a more favorable view of local banks over national banks, is noted. Less fear in the stock market but a low willingness to invest more, as well as a shift away from support for government intervention in corporate America, are also key findings from the latest release of data. Seeking to formalize the relationship between trust and finance, Sapienza and Zingales analyzed data from more than 1,000 American households, randomly chosen and surveyed via phone during two weeks in late December 2009. Trust in every component measured in the Financial Trust Index has improved since December 2008, with the exception of trust in banking institutions. Levels of trust vary widely depending on the type of bank. “Trust in community banks and credit unions is much higher than in national banks, consistent with academic evidence that local banks have more transparency, fewer hidden fees and better customer service compared to national banks,” Sapienza noted. According to the latest data, credit unions score better than any financial institution measured in the Index, with a 58 percent approval rating. Local banks scored much better than national banks (53 percent versus 31 percent), and banks in which the government has a stake are trusted the least (21 percent). 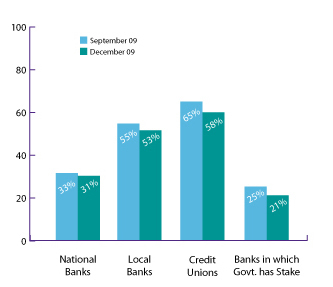 Percentage of people trusting various types of banks. In the last year, trust in the stock market has stabilized after the initial collapse in 2008, with a marked decrease in fear of a big drop in stock prices. In December 2009, 41 percent of survey respondents said a drop in the stock market of 30 points is likely, compared to 56 percent in December 2008. 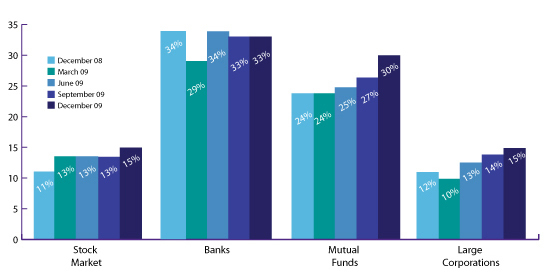 While confidence in the stability of the stock market is correlated with substantial gains in the last year, 80 percent of those most recently surveyed said they are planning to leave their investments unchanged. Additionally, people surveyed said they expect lower returns on the S&P in the next 12 months, with December 2009 respondents citing average expected returns at 0 percent (versus respondents from March, June and Sept. 2009 who cited 4 to 4.5 percent in expected returns). “While the majority of Americans no longer fear extreme events in the stock market, they do not anticipate returns to be as high and are therefore not planning to invest at this time,” said Zingales. Sapienza and Zingales also explored Americans’ attitudes toward government intervention in the economic crisis, noting that demand for regulation and government intervention has started to subside. 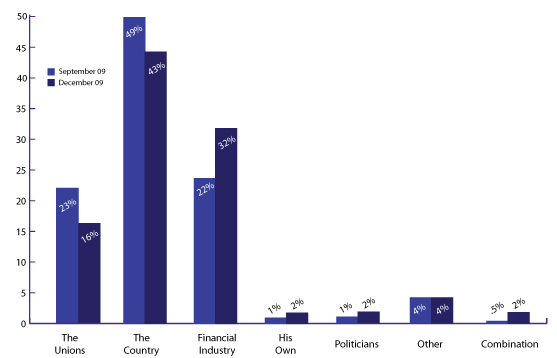 In the last six months, support for regulating financial institutions has dropped from 65 percent (June 2009) to 61 percent (Dec. 2009). Likewise, in the same period, support for caps on executive compensations went down from 65 percent to 58 percent, though support for help to homeowners only dropped from 68 percent to 66 percent. In addition, 43 percent of people recently surveyed believe the Obama administration’s policies were designed with the country’s best interests in mind. Meanwhile, 32 percent of respondents said the economic policies were designed to favor the financial industry (up from 22 percent in Sept. 2009), and nearly 16 percent said the policies were designed to favor unions (down from 23 percent in Sept. 2009). The Financial Trust Index also explored trust in the job market. 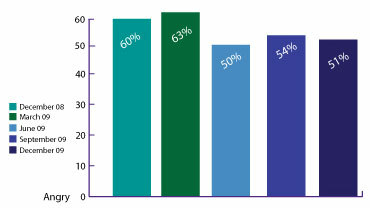 In December 2009, the perceived chance of becoming unemployed was one out of five, as compared to one out of four in June 2009. Additionally, the researchers reported an increased optimism on the housing front. 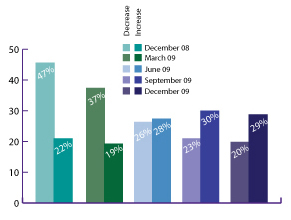 Approximately 30 percent of people surveyed in December 2009 expect appreciation in home prices in the next 12 months (versus 19 percent in March 2009). Now, only 20 percent of people surveyed said they expect a decline in home prices, compared to a high of 37 percent in March 2009. “This shows that many Americans believe the housing market has hit bottom and is starting to recover,” said Sapienza. Finally, the researchers report less anger toward the economic crisis. 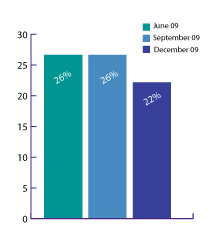 In December 2008, 60 percent of survey respondents said they were angry about the current economic situation. In the latest wave of data this figure has dropped to 51 percent.